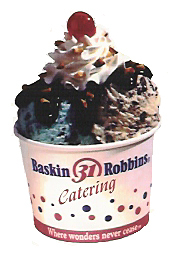 Let Baskin-Robbins Ice Cream offer your employees and guests an exciting occasion and fun dessert. 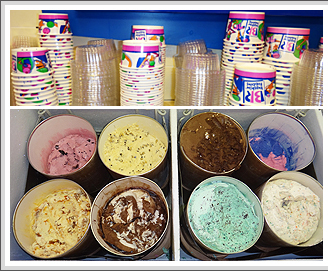 We will bring you delicious Baskin-Robbins ice cream (choice of flavors varies by the package) to your home, office, parks ,weddings , inside or outside including servicing commercial properties for tenant appreciation day. Hot fudge, hot caramel, strawberries, chopped roasted almonds, Oreo cookies, M&M, whipped cream, cherries, sprinkles, cups, cones, napkins, spoons and more. All presented in a professional display, we guarantee it! Two attendants or more uniformed professionally serving your guests to your satisfaction. We are open to special requests and will accommodate your needs. We have experience with large crowds and can handle up to 3000 guests. We can also provide a personal, professional atmosphere. We are a certified food service manager. Copyright © 2013 Baskin Robbins Catering. All Rights Reserved.